As well as being handed a can of Southern Comfort mixer (https://drinksenthusiast.wordpress.com/2011/08/17/southern-comfort-lemonade-lime-pre-mixer-tasting-notes/) I was also able to taste the Morgan’s Spiced offering of their pre-mixer with coke. With a strength of 6.4% and my love of rum, this is a perfect mix! The aromas and smells of vanilla instantly hit your nostrils with a spice mix following closely behind. A huge vanilla hit surprises you when you first taste, with the unmistakable flavour of Morgan’s Spice coming through soon after. A slight spicy end lingers in the back of your throat but its smoothness almost soothes it to a mouth-watering effect. 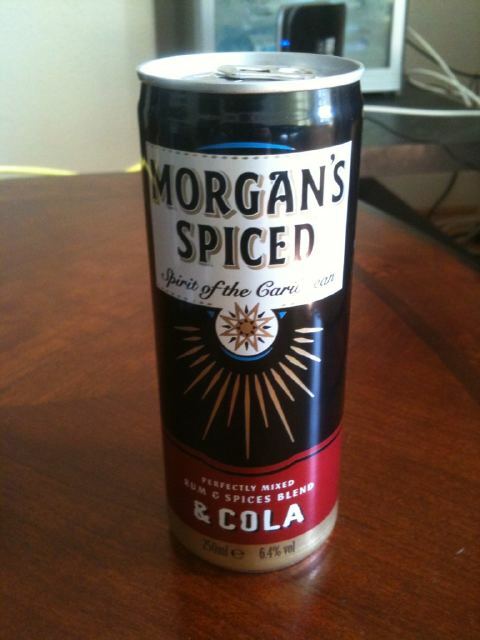 Granted it’s not on par with the fresh pairing of Morgan’s Spiced and Coke, and at 6.4%, you don’t seem to get a strong taste of the base spirit, but don’t let that put you off. It’s like a mask for alcohol – it’s there, you know it’s there, and after 5 of these you will be close to having a very good night! This is a top 5 pre-mix contender!